Boston University Professor Prothero’s history of culture wars in the U.S. is both informative and tendentious. He defines culture war as a fight for tolerance and inclusion on the part of the left while conservatives resist this in defense of a cultural status quo that is doomed. (Near the end of the book, though, this definition is strangely abandoned.) Thus he argues the first culture war was between the Federalists and Jeffersonians and that, with Jefferson’s election and re-election, the country became more tolerant and inclusive regarding non-traditional Christians being president. The problem is that this interpretation does not always work well. In the chapter on Prohibition, for example, Mr. Prothero asserts (with little, if any, argumentation) that the fundamental issue was not alcohol but urbanization and immigration. This is questionable. In addition, he does not frame the controversy over abortion–or even raise as a possibility–as inclusion of the unborn with the left on the exclusionary side. 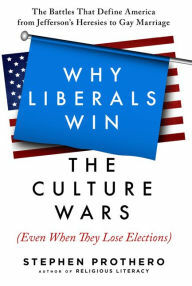 Furthermore, the book does not deal with the major issue of gun rights which is difficult to portray as a battle for inclusion and tolerance by the left and also as a battle the left has definitively won. Regarding the controversy over Mormonism (which is covered by the book), he admits that the Mormons had to surrender on the issue of polygamy but does not acknowledge this as at least a partial victory for the right. Another major fault of the book is that it sees every contemporary culture war battle as at least in part about race, even while the author acknowledges that Moral Majority founder Jerry Falwell repented of his early segregationist views and changed his ways. Mr. Prothero also does not take into account the existence of black culturally conservative politicians who have received significant white support such as South Carolina Senator Tim Scott and Ben Carson. I have emphasized the weaknesses of the book, but it is only fair to say I learned a fair amount from it, especially about the culture wars over Jefferson’s religious views, Catholicism, and Mormonism; but this does not, it seems to me, redeem the book’s Procrustean and inadequate interpretive framework.